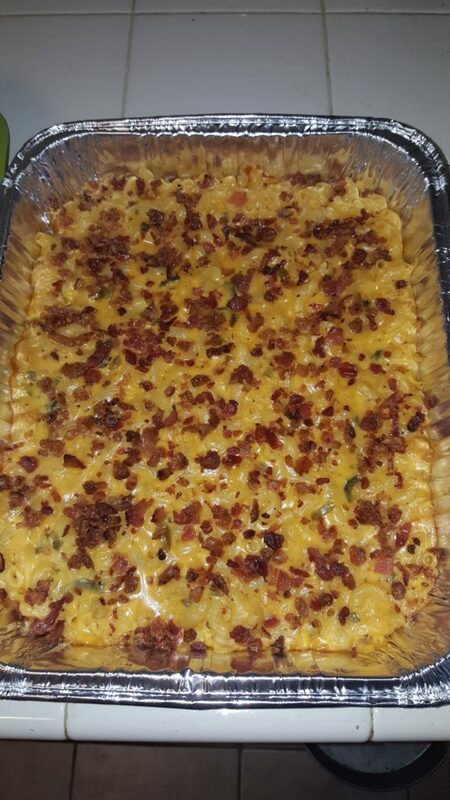 This recipe will make one ¾ full disposable half pan of macaroni and cheese. Triple the recipe for a full pan with enough extra for a bonus pan for later. If you like your mac and cheese on the hot side just increase the amount of cayenne pepper. Cook the macaroni until al dente and drain. Transfer to a large bowl or pot. Add jalapenos to pasta and stir in. Set aside. Combine cheddar cheese soup, chicken stock, half and half in a large sauce pan. Bring to a slow boil over medium heat stirring often. Add salt and pepper and mix thoroughly. Add cayenne to taste. I have found 1 tbsp is good for a mild heat. Remove from heat and add shredded cheese. Wisk until a creamy consistency is achieved. 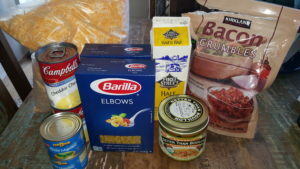 Add cheese mix to pasta and stir. Once all ingredients are combined pour into a disposable half pan. A spatula is advised to keep everything moving. Top with a generous coating of crumbled bacon. If you have a smoker going throw it on for 30-45 minutes uncovered until the top begins to brown a bit. You can also put it in the oven uncovered at 350 for around 25 minutes. Remove and serve. Pro Tip – Wash everything immediately after you are finished as the cheese mix tends to be very hard to clean after it sets up.